Kristofer Wåhlander is a valued source of inspiration and knowledge and in 2010 he was nominated to the Grand speaker's prize in Sweden. With his charisma, energetic style and a generous dose of humor, he has become a popular speaker at corporate events, conferences and educational theme days. To get his employees to always do their best, to always "give all" is what Kristofer does on a daily basis. 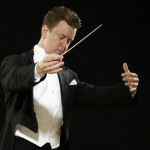 The conductor's baton has no sound and it is only when he gets his employees to shine that the concert can be a success. But it's a precarious situation the conductor finds himself in when he can only indirectly affect the results. With tricks and exercises that the audience may find useful in their daily life, Kristofer shows how to get hundreds of employees to do their work with joy. There are lots of known methods to train our bodies and many of us do it on a regular basis. But how often do we train our mind? How do you do to get your employees to handle pressure and how do you become "best when it matters"? Kristofer Wåhlander shares his knowledge of how we can create change in our own consciousness and perform at our best when it matters the most. A Symphony orchestra consists of many different musicians with their own ideas, opinions and emotions. If they go out of sync or end up on an emotional collision course, it can have devastating consequences. How do you get such a diverse crowd to work as one body and how do you find yourself in a greater teamwork? Kristofer Wåhlander shares his 'tricks of the trade'. Kristofer lectures in Swedish, English and Russian. "In the same way as Kristofer Wåhlander always delivers a first class experience as a conductor, he similarly offers an extraordinary experience as a speaker . With passion, insights and energy he shows how the leading of a symphony orchestra is an excellent and relevant metaphor for our daily challenges in business and private life. Kristofer has a great ability to open up and speak from his heart and at the same time, with humor, deliver what is of significant importance to the listener. " "Kristofer's leadership lecture with the symphony orchestra as the basis is really thought-provoking and helpful – It actually belongs to one of the best I've been to. How many have noticed that the conductor has to deal with 160!? creative professionals who all have to relate to the conductor's interpretation of a case, a work, that is guaranteed that everyone in the orchestra has its own approach to? Indeed, an examination of the leadership. " “With great passion, Kristofer makes us open our minds and think in other patterns. He gives executives from different industries, unique and personal examples of leadership, interaction and performance. An exciting entrepreneur from a classical and traditional industry "
“We had the privilege of having Kristofer as a source of inspiration in connection with a kickoff for our company. The theme of the lecture and workshop was interaction, a subject that Kristofer turned out to master and meet with very exciting angles. Kristofer's experience in directing a symphony orchestra for common goals, turned out to be able to inspire us as a company. It became a highly appreciated feature for our employees and gave us energy and new ideas on how to create harmony and team work within an organization. "Kristofer Wåhlander delivers as usual. Clever and important matters while we are laughing so that the tears are flowing. Few people can handle this combination. " "I have been to many presentations by leadership- and management consultants. But I've never been so emotionally touched by anyone as I was by Kristofer. In a collaborative, engaging way, he brings out what is really essential in successful team leadership..
"Kristofer is a natural-born speaker with an extraordinary ability to engage and inspire. His on-stage presence has captivated me on several occasions. "